Charles Dickens could have been writing about Palm Sunday. The famous opening of his novel A Tale of Two Cities could so easily have been describing the contradictions of the events of the last week of Jesus’ earthly life. And the contradictions of the two cities that Jesus encountered. The city that so enthusiastically welcomed him as a king. And the city that just as enthusiastically crucified him. To paraphrase Dickens’s words as we ponder the events of that week in Jerusalem that began with a celebration and ended with a death. The best of times that became the worst of times. The season of Light that so quickly descended into the season of Darkness. A spring of hope that so quickly became a winter of despair. A Sunday when the crowds all thought they were going directly to heaven, followed by a Friday when all were going direct the other way. And at that point what no-one realized was that they certainly all would have been going the other way were it not what that man who rode into Jerusalem on donkey was achieving for them on the cross to which they nailed him. Palm Sunday is a day of opposites. 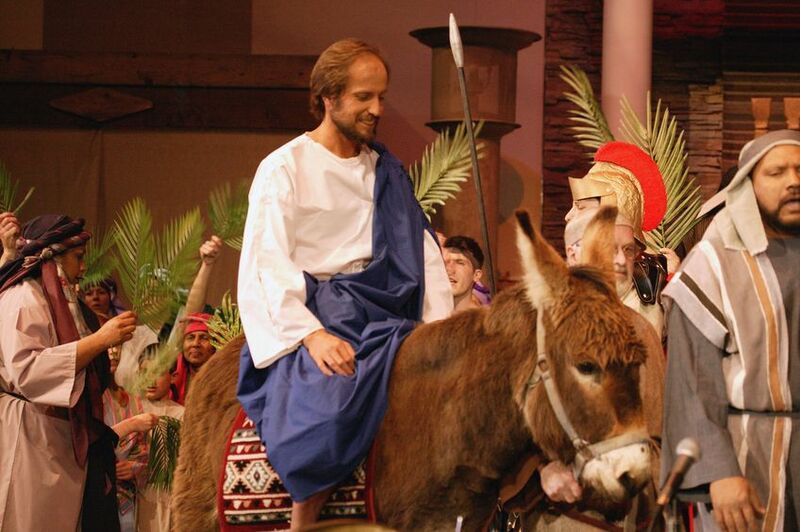 It is a day when we rejoice at the entry of Jesus into Jerusalem on a donkey. But it is also a day when we begin to look forward to the cross, a day when we think of his forthcoming suffering. So we have not one, but two gospel readings on this day – the Palm Gospel proclaiming the triumphant entry of Jesus into the city of David, followed by the Passion Gospel, the long retelling of the crucifixion, of which we had the short version today! And we wave our palms as the crowds did then – but now we make them into crosses to remind us of what is to come. On this Palm Sunday we are asked to rejoice with the crowds as Jesus enters Jerusalem, only to be so quickly asked to look at the suffering of Jesus. What would you have felt had you been amongst those crowds in Jerusalem? Try and imagine yourself there, and remember that you would have known nothing about the resurrection nor of the powerful coming of the Holy Spirit. They have yet to happen and even the disciples of Jesus weren’t prepared for what we now know was the final outcome of these events. Like them, if you were there, you would be caught up in the events as Matthew recounts them. This Galilean, who had spoken with authority, healed so many and called God his Father, had come riding into the city amidst shouts of acclamation. Would he be Israel’s King? Overthrow Rome? Would this son of David follow David’s star and succeed? We would have thrown branches in his path and shouted our support. Hosanna – save us! Because like everyone else what we wanted so much is salvation. Salvation that we could identify with and understand. Salvation in our own lives, now; freedom from oppression, freedom from poverty and injustice. And it seemed that that was something Jesus could have made possible. But a few days later and just how much has everything changed. This man who carried our hopes stands alone, marked by scourging, mocked by a crown of thorns and a purple robe. There is nothing dignified about his death. Everything is as bad as it could possibly be, worse even. The crowds call for his death. How would we have behaved now? Are we now hurt and angry and calling for his death? He has not succeeded. He has let us down. There is no kingdom for Israel. He is to be killed. He has seemingly failed. Our dreams are shattered. Yet in reality it is not Jesus who has failed the people – it is the people who have failed Jesus. Stay with that failure, for failure is part of our human experience. We fail. We fail so often. We fail other people. We fail the demands we make upon ourselves. We even fail our faith and we feel that our faith fails us – or we feel that God fails us. Our prayers seem unanswered and it feels that God doesn’t do what we feel he ought to – for us, for our world. But in all of this, Christ has been there before us. His experience of failure was so intense that he felt utterly abandoned even by God as he hung on the cross. He knew the very depth of loneliness and isolation. He knew darkness and dereliction, and in experiencing it he made it redemptive. He is our suffering God, completely with us in our pain and failure, meeting us there and then bring healing and wholeness – for that is what salvation means. He shows us that we can trust God to work in our lives and to redeem our pain also. For that is why he went to the cross. To turn Charles Dickens on his head – metaphorically speaking of course! It was the worst of times when Jesus went to the cross but he turned it into the best of times. It was the season of darkness, but Jesus has made it a season of light. It was the winter of despair but Jesus has turned it into a spring of hope. We were all – every single one of us – most definitely going direct the other way but the cross of Jesus and what he suffered there means that we can now all go direct to heaven. Thank you for your comment. It is, of course, probably the case that given the thousands who were in Jerusalem for the feast that the crowds who cheered Jerusalem as he entered the city were quite a different group of people from those who cried ‘crucify him!’ There is a tendency for people to imagine that there was just one crowd who changed their minds about Jesus but that really isn’t the case in my opinion and can’t be backed up from the gospels.